The 2018-2019 flu season has arrived. Each and every year the Centers for Disease Control and Prevention (CDC) and other healthcare providers remind the general public of the same preventative measures: get a flu vaccine, wash your hands and stay home if you're sick. 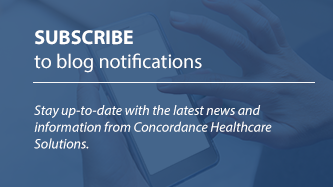 Healthcare distributors, like Concordance, see a different side of the flu equation each season as we supply hospitals and other care providers with the necessary supplies for flu prevention, diagnosis and treatment. Day in and day out, we deal with the need for supplies such as vaccination tools, hand sanitizer, test kits and flu treatments. We take extreme care to ensure our customers are provided with the supplies they need, when they need them. Last year, influenza cost employers an estimated $21 billion in lost productivity, infecting 25 million workers. Healthcare providers in hospitals, urgent care and primary care facilities battle flu season by building functional, end-to-end supply chain and logistics systems with the help of their distributor. The role of the supply chain ensures effective patient treatment, handling of supplies and stock management. The ultimate goal is to ensure the uninterrupted availability and delivery of quality products from our manufacturer and supplier partners. The urgent care market has been the go-to point of care in recent years for flu testing because of the ease and availability of walk-in testing. 10-15 years ago, urgent care patients went to their primary care physicians with flu concerns. As it became more difficult to make immediate appointments with primary care physicians, patients began visiting urgent care facilities instead. Patients with flu concerns moved towards urgent care simply because they wanted immediate tests and treatment. This created an important need for distributors to build effective supply chains in support of urgent care facilities. With the flu, particularly, there is the possibility of false negatives in non-serum testing. This creates the problem of an inaccurate diagnosis and poor patient care. Knowing proper patient swab procedures can help reduce to occurrence of false negatives. In person hospital staff training is important in order to ensure accurate patient swabs, which in turn helps prevent false negatives. Providing this training for hospital staff is one example of how Concordance representatives partner with suppliers to deliver service beyond expectations. At the beginning of flu season, hospitals and pediatric offices want to be well stocked with needles and syringes in order to administer flu vaccinations. Concordance and other distributors provide these products in addition to supplies needed to diagnose and treat the flu such as Tamiflu. In order for the flu to be treated by Tamiflu, it must be detected within the first 48 hours. Distributors provide testing mechanisms that allow detection of Influenza A and B viruses in pediatric patients early and accurately enough to treat with Tamiflu. As we age, human immune defenses weaken. This is why those aged 65 or older are also a higher risk age group for serious flu complications similar to pediatric patients. The CDC advises prompt treatment in people who have the flu, who are also at high risk for more serious flu complications. Other than typical flu-like symptoms, emergency signs to look for in elderly patients include difficulty breathing, confusion, sudden dizziness, chest pain or pressure. Long term care (LTC) facilities provide healthcare to people who are unable to manage independently. This includes elderly individuals at higher risk of flu complications. Distributors ensure LTC facilities, such as nursing homes and senior living communities, are well stocked with preventative supplies during flu season such as hand sanitizer. These supplies aren't just for residents and healthcare providers, but for visitors as well. In addition to hand sanitizer, face masks are also used to help decrease the spread of seasonal germs. 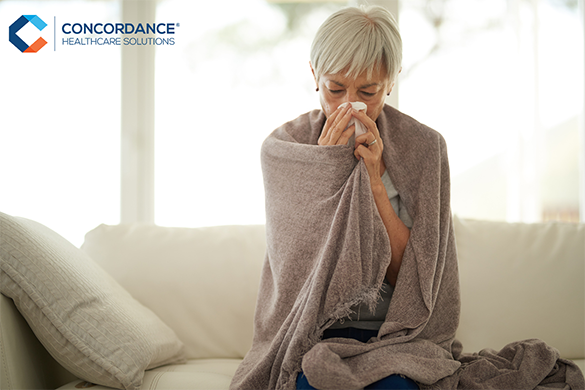 With an experienced team and access to thousands of suppliers, Concordance Healthcare Solutions is prepared to provide the supplies you need to fight the flu. We support building functional, end-to-end supply chain and logistics systems that provide our customers the right products at the right time.